I have been talking a big talk. You all know I love to talk. It seems prairie women of all ages can and pickle this time of year. I promised to embark and become a canner myself. But the rubber needed to meet the road and I actually needed to start and get it done. I needed to quit talking about it. So hold on for this long, picture filled blog post and you will learn about the challenges of my first ever pickling adventure. 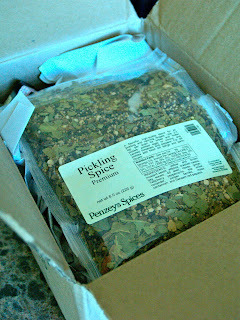 The UPS man delivered the above box from Penzey’s Spices yesterday afternoon. It was the green light to begin pickling. After a family swim at our community pool and when our three kids were fast asleep, my husband and mother-in-law washed a sink full, a bushel, to be exact of “picklers”. This is the technical term the local prairie women call the cucumbers needed for pickling. Did I grown them myself? I paid $36 for a bushel of picklers from our local Hutterite colony. $36 and I don’t have to grow, water, weed or pick them. They had been rinsed once and then I didn’t even have to scrub them again thanks to my kind kitchen helpers. It was quite a good deal for me. They weren’t just kind kitchen helpers. Nathan and Carol were putting the pedal to the metal and actually making me become a pickling, canning woman. I love to try new things. But I like to be good at them. Strange things I am not good at are not always easy for me to start. Thankfully my husband with out saying a word knew that and helped get the process started. I toiled over how to make the pickles. 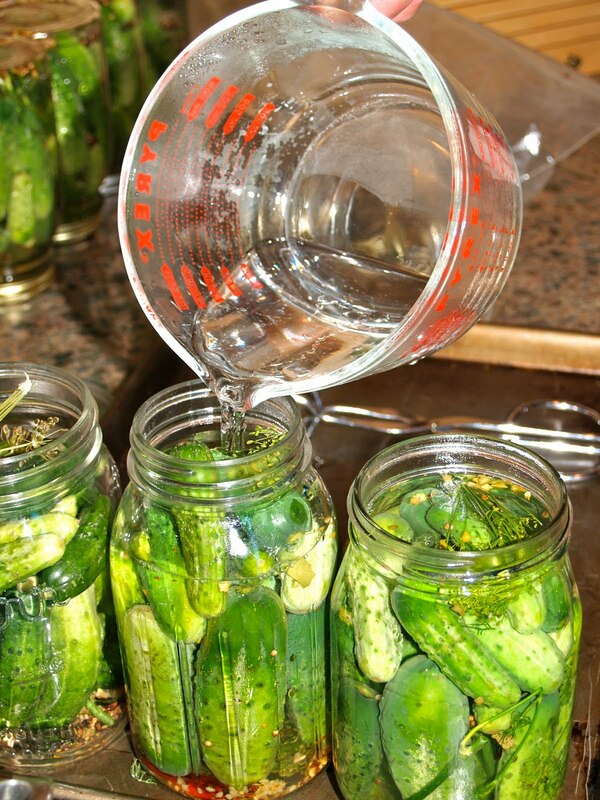 Cold water, hot water, brine, no brine, canning or refrigerator. If you ask around, each woman has a different recipe and a few men share theirs also. I finally just decided to go with the recipe recommended by the local lady that sat next to me while we both got our hair on Wednesday together. She goes to our church and has a community wide reputation for being a great cook. She told me “just use Alice’s recipe in the Centennial cookbook”. 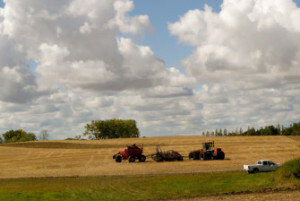 Easier said than done since I don’t have the Centennial cookbook created twelve years ago when I was a student at the University of Georgia, never moving back to North Dakota and was certainly not going to be living on the remote prairie with my husband and family. By late afternoon, my mother-in-law, Carol, had copied Alice’s recipe for me from her copy of the Centennial cookbook. I went to our local grocery store for a few necessary supplies. The store was wiped clean of Alum. It is a pickling rush on the prairie and they wouldn’t have any in stock until next Tuesday. My pickling time will be long over by then. No Alum then. Fine by me. I don’t even know what the stuff is at this point and my recipe only said that I needed a pinch of it in each jar. But at the swimming pool while following our girls around in the baby pool, my friend Stacy told me you need the Alum for crispness in the pickles. 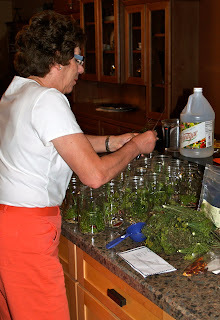 Then Carol showed up to help me pickle. She said I would need the Alum. Final decision. I headed over to Stacy’s house to borrow her Alum. She already it waiting in a bag for me. I also bought lids for the boxes and boxes of jars Carol supplied me with and I only bought wide mouth lids. I need both regular and wide mouth and thankfully Carol had some on hand since it was after 9PM when we embarked on our pickling adventure on the prairie. We live 90 miles from anything open 24 hours a day and everything is closed by 8PM on the prairie except for the Lariat Lounge or Blondie’s the bar. Then there is the dill. You need two heads of dill per jar, one for the bottom and one for the top. Once again, my mother-in-law, Carol to the rescue as she called her neighbor and drove over to get some from her garden…in the dark. I added 1 tsp. pickling spice, 2 dried red chili peppers, 1/2 tsp. of minced garlic (the recipe says 1 garlic clove but I wanted to use up this huge container of minced fresh garlic I had on hand) and 1 head of dill on the bottom of each jar. I had 4 jalapeno peppers and 1 banana pepper in my garden at the moment so I made 5 jars with spicier mixture, using one pepper in a jar plus adding a few tosses of red pepper flakes. I also did 5 jars of extra garlic because I love garlic pickles. I labeled with a S or G to remember those “special” jars. Our pickling on the prairie was kicked off and we developed quite a great routine of filling the jars with the pickler cucumbers. Make sure you get the big ones on the bottom and fill in the little ones around them. 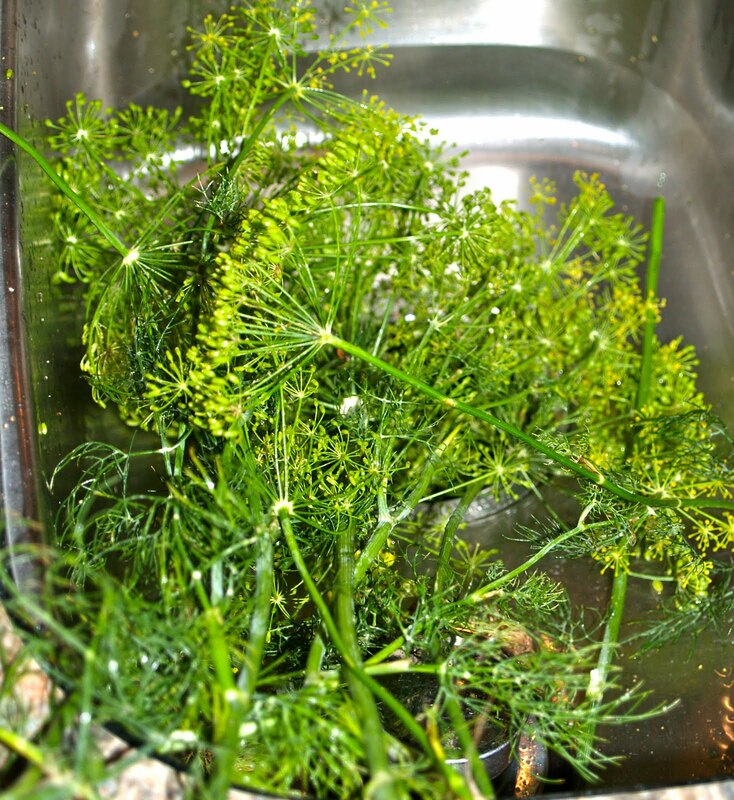 We left room at the top for the second head of dill. I increased the brine recipe by 5. It called for 9 cups of water and I used 45 cups of water. Well water. Not chlorinated city water. That was another discussion point for women telling me how to pickle. 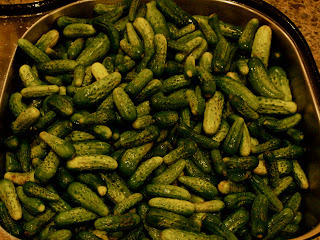 What type of water you use matters and city water doesn’t always turn out the best pickles or so they say. I don’t really know that but I believed them. Then there is vinegar, sugar and canning salt in it. Once it starts boil we poured it over our cukes while keeping the brine boiling. It took about 4 cups of brine per quart of pickles, much more than Nathan and I thought it would. We ran out of brine but then once again Carol came to the rescue and pulled out a recipe from her pocket. Literally it was in her pocket. She obviously knew we wouldn’t have enough brine, of course. We finished with that recipe from her pocket. It had the vinegar and salt put right into the jar. We just poured boiling water over the jars. Those jars are now labeled “2”, for our second pickle recipe. We wiped the jars clean and put our seals over the jars. We warmed them in water but did not boil them. 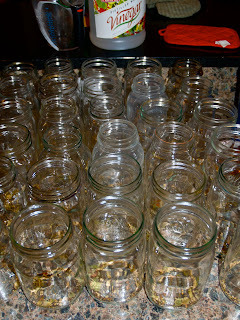 Next step was to tip the jars upside down so everything sealed up properly. Now we really smelled like pickles and it was nearly midnight. We still had two grocery sacks of cucumbers left over and they are storing nicely in my fridge. I couldn’t pickle any more because of course I did not have enough lids. This morning what do we have on our counter? It looks like a pickle or about 36 jars of them to be exact. Will they smell and taste like pickles? That is yet to be determined and we’ll have to wait four to six weeks to find out fully if this grand pickling adventure I have embarked on will be a first time success or not. I also need to put them into a refrigerator in a few days to keep. Our little extra fridge in the basement is going to be full plus we need an extra fridge to soon to appear in our mudroom. We always intended to put one in the mudroom but have never found an old fridge. People tend to keep them for decades and generations. A few of the things I need for pickling that I never knew like Alum, well water and an extra refrigerator. Now, I know. One thing is for sure, my first time pickling would have been a disaster if it wasn’t for my mother-in-law coming to my pickling rescue. I will be a pickling and canning prairie woman someday. I am working on it. For the time being, I will keep talking about it. Just reading that made me tired. Good job Katie and Carol. I hope I will be getting one of those jar of pickles for Christmas. Hint hint. FYI in case you don’t know this, but the flip and seal method (the one you used) is not approved by the USDA because you need to have the jars and the filling at the appropriately high temperature right at flipping. If you don’t have the high temp and the appropriate ph, the contents are at high risk for botulism growth–because the spores won’t have been killed by boiling. What great directions. I hope you will consider linking this post up to our “Canning Week Blog Party” Aug. 23-27. We will be posting lots of tips, recipes, give-a-ways and a linky party all to encourage and educate bloggers on canning. It should be a lot of fun!!! You are incredibly amazing, Katie!! Enjoyed this post..but I agree with Sara- just reading it made me tired!! Nice to have Carol there to help you…she is a gem! Looks delish! Thanks for linking up to our party. I hope you signed up for our great give-a-ways over on Jen’s blog as well!! !